20-10-2010 LANGUAGE RIGHTS IN ROMANIA DIFFERENCE BETWEEN PAPER AND PRACTICE On paper Romania is a country that does not assimilate it’s autonomous peoples by force. It is even a place where old ethnic controversies have been abolished completely. It is even a country where autonomous people are protected by righteous laws and treaties. In practice these rights are violated on a very great scale. Here you can read about ten cases in which Romania seriously breaches its own domestic, bilateral, European and international legal obligations. The crystal clear law 215 of 2001, which states that the use of the autonomous language is compulsory in administrative regions where the population is higher than 20 % is simply violated on a large scale. We asked the competent authorities to comply with the law, here you can read more. 20-11-2010 PLEASE HELP US HELP Our foundation sends a yearly mailing in which we ask for donations, the Dutch and Hungarian language versions can be accessed here. The European Committee Human Rights Hungarians Central Europe is an independent foundation that strives for the creation of a Central Europe where discrimination on the bases of race, language and ethnicity are abolished. By this way we would kindly ask you to support our foundation. You can support us anonymously or by bank transfer. Donations to our foundation are tax deductible from Dutch income tax. 23-05-2011 NASTY NATIONALISM RETURNS TO CLUJ NAPOCA. Last Monday 23 may, all public welcome signs at the entrance of the city disappeared. These welcome sign, also welcomed the visitor in the Hungarian language , which is the native tongue of almost 20 % of the population of this city, and it used to be over 50 % before the post second World war ethnic cleansing. Together with the removal of these signs, a very discriminative sign has been placed at the statue of king Mátyás, which is the symbol of the Hungarian community of this city. We issued a press statement regarding these discriminative events (Dutch language). We also sent a letter to the mayor of Cluj-Napoca (Hungarian: Kolozsvár) urging him to dissociate himself from the heritage of Funar and to pay attention to ratified European laws, such as the European Charta for regional languages. The public letter to Mr. Apostu can be read here in English, Hungarian German Romanian and Dutch. 25-05-2011 ANWB CHANGES ROMANIAN AND SLOVAKIAN MAPS In 2010 September we wrote a short letter to the ANWB (Dutch Automobile club), we informed them about an inconsistency regarding the usage of bilingual place names in Europe. We noticed that bialngual signs were used for the Swedisch speaking Finns, the Basks in Spain, the German speaking Italians, however bilingual signs were missing for Slovakia and Romania. The ANWB was so kind to correct this inconsistency — Thanks ANWB. 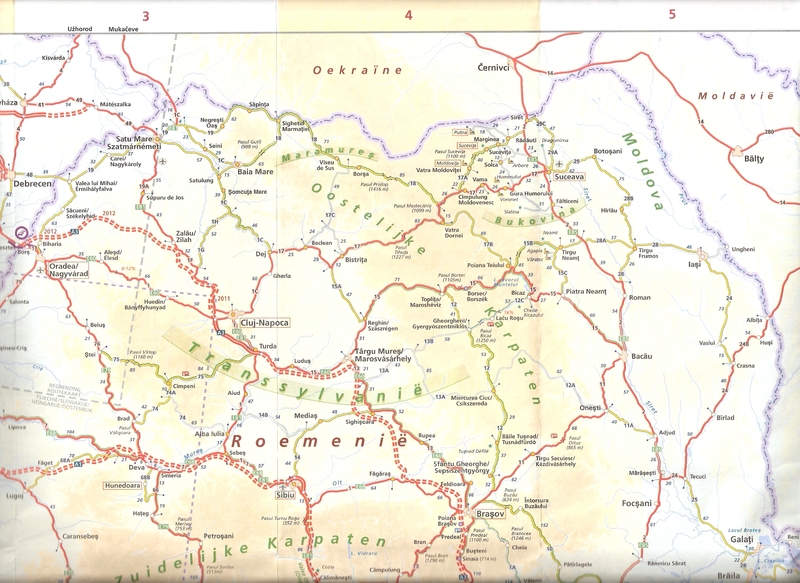 Here you can see the old maps for Slovakia and Romania and the new maps for Slovakia and Romania. 02-08-2011 RESPECTING EUROPEAN LAWS IS A SENSIBLE TOPIC IN ROMANIA On 26-07-2011 the treasurer of the foundation placed a sticker on the illegal an monolingual plaque of the historian Iorga, which had been placed on the 23th of may next to the statue of king Matthias in Cluj –Napoca, (Hungarian Kolozsvár). The sticker contains the following text. Where is the Hungarian inscription? We live here as well. Start to respect European Laws right now! Unfortunately respecting European treaties concerning language rights and civil rights is still a very sensible theme in Romania. Although Romania ratified the Charta for regional languages in 2008, many language rights deriving from this treaty, such as receiving basic public information in Hungarian are still denied. You can read our press release here. (Dutch language only) The video’s of this action can be viewed under the multimedia section or by pressing this link. The video clearly shows that this plaque is guarded by the city council of Cluj-Napoca. 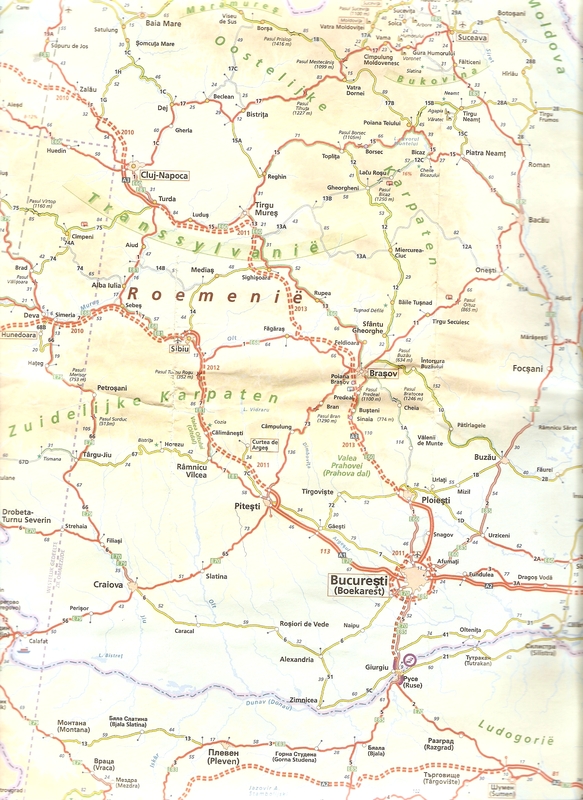 18-02-2015 Ethnic hate in Cluj-Napoca / Kolozsvár / Klausenburg On February the 5th the court of Cluj-Napoca annulled court order nr 4800, which ordered the placement of bilingual Romanian-Hungarians place signs at the entrance of Cluj-Napoca, since the city council and the major of Cluj-Napoca lodged an appeal The court didn’t repudiate our language claims, but ruled that a Dutch NGO had no competency in this matter and therefore the act has been annulled. Till present day ethnic autonomous Hungarian speaking Romanians are subject to ethnic hate in Cluj-Napoca. On public media several inhabitants of this city reacted with hateful, racist , xenophobic and discriminating remarks to this news. This proves that a part of the population is still afraid of ethnic Hungarians and is ignorant about their citizens rights. PRESS RELEASE 22-04-2014. ROMANIAN POLICE PROHIBITS THE USAGE OF THE HUNGARIAN LANGUAGE. 17-06-2016 PRESS RELEASE CAMPAIGN WHO MADE THE EUROPEAN DREAM A NIGHTMARE? Since the European Union is incapable to maintain and protect its own core values such as human rights, European Identity and Rule of law, the population of the UK has no other moral choice than to choose for leaving the European Union on the 23th of June. 15-05-2015 POT CALLING THE KETTLE BLACK Recently channel 4 made a report on immigration from Romania to Great Britain. 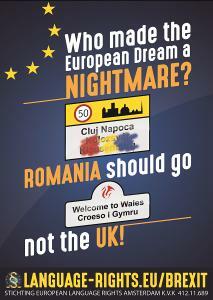 the Romanian ambassador in England and the prime mister of Romania, totally lack any moral ground to complain about the alleged discrimination of Romanians in England. They should have a look in the mirror before lecturing the British on discrimination. Appeared in the Romanian press Romanian version here ; Hungarian version here . 16-03-2016 Press Release. 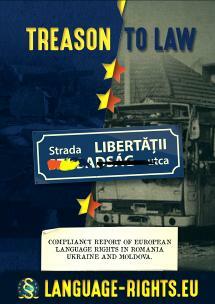 The foundation European Language Rights presents its Report Treason to law. PRESS RELEASE 15-11-2018 IT KIN NET. The foundation European Language Rights launched its “It Kin Net” campaign, which is Frisian for: It Can Not. Purpose of our campaign is to rise the general public’s awareness about the undeniable rights of the Frisian National minority of having an own identity. 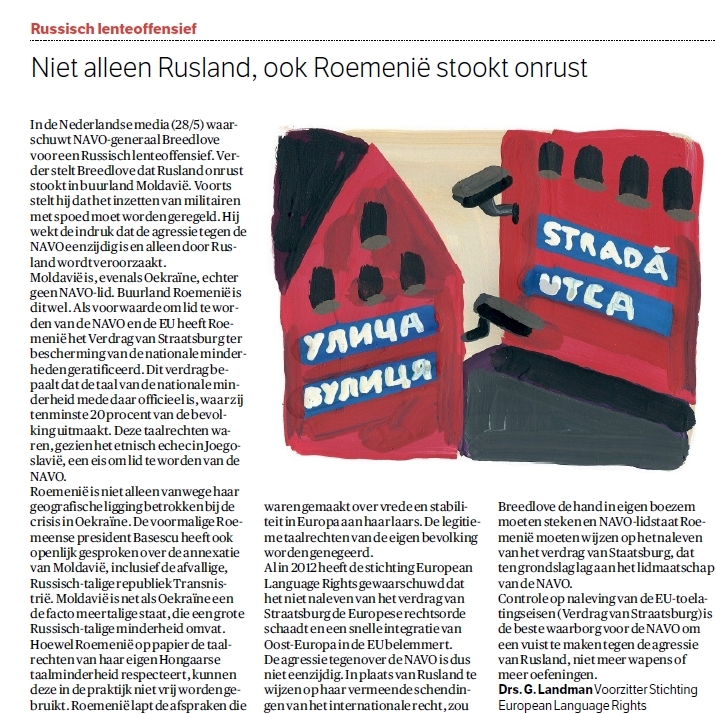 06-04-2019 Campaign in Amsterdam : “The Shame of the European Union”.